This war memorial board was unveiled in the church in 1921 and a report of the event appeared in the Keighley News dated 8th October of the same year. 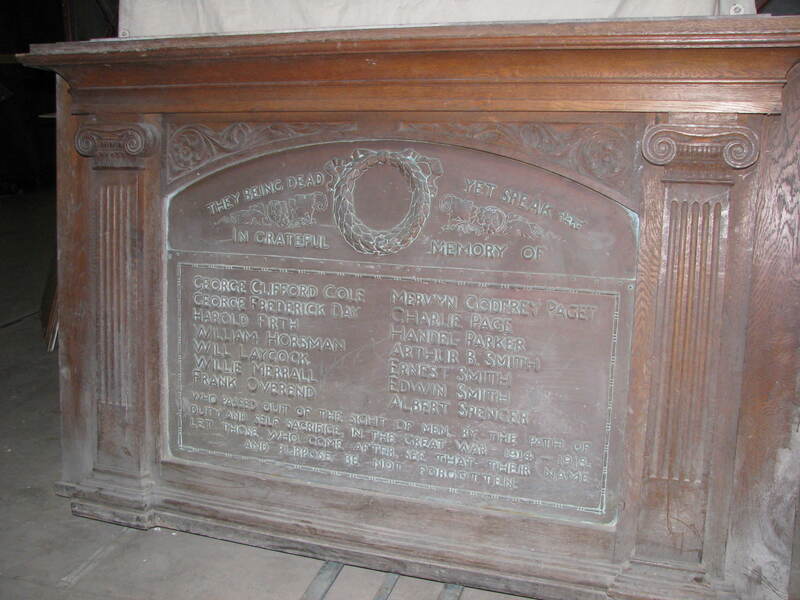 The frame is made of oak and the central panel is bronze and inscribed with fourteen names of men from the church who died in the Great War. There is a laurel wreath in the centre of the bronze panel. "WHO PASSED OUT OF THE SIGHT OF MEN BY THE PATH OF DUTY AND SELF-SACRIFICE IN THE GREAT WAR 1914 - 1919"
LET THOSE WHO COME AFTER SEE THAT THEIR NAME AND PURPOSE BE NOT FORGOTTEN"
The church was closed (possibly around 1981) and the building was taken over by an Asian organisation. This memorial is currently in the care of Cliffe Castle Museum, Keighley. Is your society only concerned with casualties during the wars or do you include all who served? My father served in the 2nd World War but I’m afraid I don’t have much information I.e. regiment etc although he did eventually end up as a Chindit in Burma. He was at Dunkirk and I understand was given a small Civic welcome on his return. I have always been told that he was met off the train at Ingrow Station by the mayor & I think a band? I would love to know more but don’t have a clue where to begin. His name was Peter Joseph Michael O’Neill and would have lived on Grafton Road,Keighley at the time. I apologise if this type of enquiry is not something you deal with I’ve just come across the site on the internet as a I was looking for some history of Keighley. Yes, we certainly are interested Anne. I'm away at the moment but will get in touch with you after our holidays. When we started researching in 2001, we found only names of men on local memorials and as we felt their sacrifice had ‘worth’ and most of them lived around the river Worth we felt the name was apt. Also, Keighley’s motto is By Worth, which fits rather neatly with our name. We have since expanded our research to include everyone from Keighley and the Worth Valley who served in wartime and are currently focussing on women in the Red Cross Voluntary Aid Detachment who were mostly nurses. We are also researching conscientious objectors from the area. Our Project researches local people from Keighley and the Worth Valley who served the country in wartime. Our earliest records are of soldiers who fought before the Battle of Waterloo! We follow all available sources of information and use the information in these sources to create a biography about each person for our archive. Please contact us through our ‘Submit’ page form to add a person to the archive. If you would like to work with us or join our Project, please visit our ‘Contact’ page under ‘About’ in the menus at the top of this page. All site content is copyright to The Men of Worth Project Community Interest Company from 2007 to the present day, unless otherwise indicated. Website managed by Andy Wade. Website development and consultancy by Sharp Hosting.